I am asked frequently why I do not include additional asset classes. This question probably stems from the popular, but erroneous, belief that more is always better. Some also believe that being more inclusive may reduce data snooping issues. However, there is method to my madness, and logical reasons why I exclude several commonly-used asset classes. First, as my latest research paper points out, high volatility is a success factor for momentum investing. Even though currencies, like most every other asset, benefit from momentum, their low volatility is one reason we exclude them from our portfolio. As cross rates, currencies also have little inherent risk premium. This contributes to their having low expected momentum returns. In Asness et al. (2009), "Value and Momentum Everywhere", currency returns and alphas were among the lowest of the assets they looked at. An asset class that does have the requisite volatility is emerging market equity. Many investors feel that emerging markets merit being a separate asset class. However, there are unknown risks associated with these thin and illiquid markets. First, they have only about twenty years of price history. No one knows how emerging markets would have performed in October 1987, for example. It likely would not have been a pretty sight. Because they can suffer from sharp and rapid price declines, one often aggregates emerging markets into baskets that trade as a group. This stems from the belief that diversification among emerging markets will reduce their risk. However, baskets of emerging market stocks have contagion risk causing them to trade together as a whole. Aggregation and contagion can amplify and accentuate liquidity and other systemic risks. During the Russian debt crisis, markets as far away as Singapore suffered major outflows of capital and extreme price volatility. Not only are correlations higher now among the emerging markets themselves, but they are also higher between emerging and developed markets. 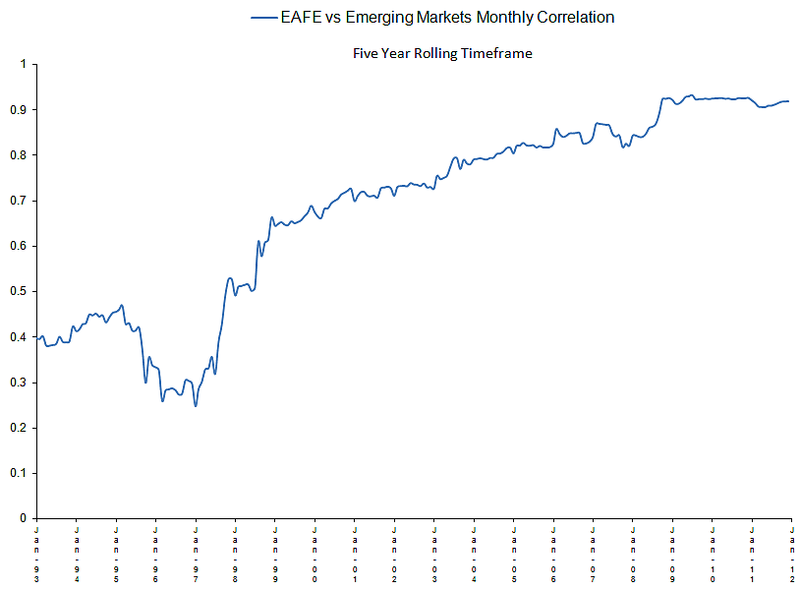 The following chart shows how correlations between emerging and EAFE markets have risen substantially over the past fifteen years. (The correlations between EAFE and US markets have also risen substantially, but that's another story.) The five-year rolling monthly correlations were below .30 in the 1990's. For the past three years, the correlations have remained steady at over .90. From a diversification point of view, emerging markets have lost some of their appeal. Another volatile asset class that has attracted a large following in recent years is commodity futures. The logic here is that commodities act as an inflation hedge. Yet real estate, natural resource, other high tangible book value stocks, and even Treasury bills can serve that same purpose. The underlying problem with commodity futures is that they, like currencies, are not an asset class in the normal sense. Stocks and bonds exist as vehicles for raising capital. In return for this, investors can expect streams of payments from bonds or residual cash flow from equities. Commodity futures, on the other hand, are a zero sum game in which the profits and losses of contract buyers and sellers are equal, disregarding transaction costs. Futures contracts cease to exist on their expiration dates, and there is no wealth created in these transactions. Because gains and losses are symmetrical to the buyer and seller of a futures contract, one cannot say that the buyer, by taking on volatility, is entitled to a positive return, since the seller, by the same reasoning, would also be entitled to a fair return. One of them must lose for the other to gain. In the past, buyers of commodity futures oftened enjoy a systematic positive return called the "roll yield" that flowed from hedgers to speculators. Hedgers were generally short sellers who felt a need to lay off risks of the unknown in their capital-intensive business. Speculators, who had no need to participate in commodity markets, were induced to take the other sides of these trades because of the roll premium they received. However, all this has changed during the past 15 years. Using data through the 1990s that showed commodities to be a decent portfolio diversifier, academic papers, like the one by Gorton et al. in 2004, induced institutional investors to invest heavily in portfolios of passive commodity futures. Since then, endowments, pensions, hedge funds, risk parity programs, and the public have all scrambled to add over $300 billion of long commodity index futures to their portfolios. Many pension programs now feel they should have 5-10% of their portfolio assets committed to commodities. This new group of speculators insists on going long regardless of price. They became increasingly large compared to the number of hedgers, so the overall roll yield dissipated and became negative. From 1969 to 1992, the roll return averaged 11% per year. Since 2001, it has averaged -6.6%. The odds are therefore stacked against investors who passively hold long commodity futures. Several commodity indices, like the PowerShares DB Commodity Index or the Summerhaven United States Commodity Index, try to reduce the roll yield disadvantage by selectively seeking futures contracts, when possible, that still offer a positive roll premium. However, all commodity index funds, regardless of their roll premium capture inclinations, face another formidable obstacle. These are the front-running costs from regularly rolling over their positions. They occur when others trade in front of the commodity futures rollover dates, then take profits afterwards. Zyiquan Mou of Columbia University estimates front-running costs at 3.6% annually from January 2000 through March 2010. JP Morgan Commodity Research reorted in 2009 that roll returns have put a drag of 3-4% per year on commodity index returns since 1991. These hidden costs can quickly take the wind out of the sails of commodities futures indices. Rising correlations are another problem associated with commodities. The average correlation coefficient between equities and commodities was -.27 from 1970 through 2003. It has risen into positive territory over the past five years. More importantly, during both the 1929 stock market crash and the 2008 financial crisis, the correlation between equities and commodities shot up to over 80%. Commodities diversification was lacking when it was needed the most. A 2011 research paper by Daskalaki & Skiadopoulos called "Should Investors Include Commodities in Their Portfolios After All? New Evidence," shows that the introduction of commodity instruments in a traditional stock/bond portfolio is no longer beneficial for a utility maximizing investor. This is based solely on past performance and not the additional reasons given above. From January 1975 through December 2011, the GSCI had an annual average return of 6.1% and standard deviation of 19.3%, versus a 7.7% return and 4.3% standard deviation for five year Treasury bonds. We see from several points of view now that passive commodity indices are no longer such an attractive addition to traditional stock/bond portfolios. The 2012 NAAIM Wagner Awards for Advancements in Active Investment Management were announced yesterday by National Association of Active Investment Managers. I'm in Atlanta now to accept the first place award and $10000 prize, and to present my paper at their annual conference. I'm honored to be receiving this recognition for my research work. During the past 20 years there have been some 300 published research papers written about momentum. 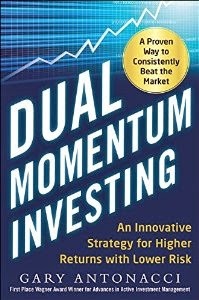 Most have dealt with momentum applied to individual stocks, bonds, commodities, or currencies. 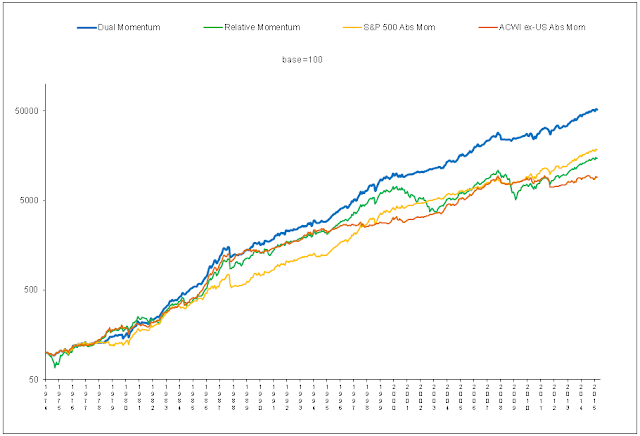 (All four publicly available, fully disclosed momentum funds apply momentum only to individual stocks or commodities.) Less than five percent of momentum research has looked at asset groups. Fewer still have applied momentum simultaneously to multiple asset or risk classes, even though this gives the best results. My research paper last year (the second place winner of the 2011 NAAIM Wagner Award) used fixed income as a safe haven from riskier markets under appropriate market conditions. This was an ad hoc step in the right direction. What was really needed was a logical framework that systematically deals with regime change in order to better exploit momentum's profit-making potential. In my new paper, I believe I've accomplished this. You can download from NAAIM my paper and all the other papers submitted for the Wagner awards, or you can download an updated version of my paper here. I welcome feedback and comments.